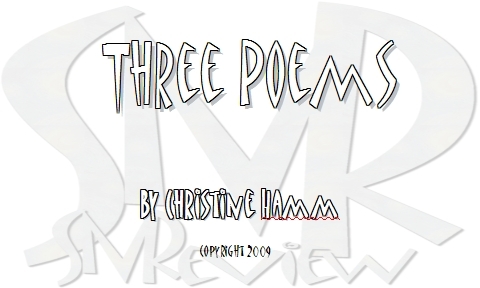 Copyright 2009, Christine Hamm. © This work is protected under the U.S. copyright laws. It may not be reproduced, reprinted, reused, or altered without the expressed written permission of the author. won the MiPoesias First Annual Chapbook Competition with her manuscript, Children Having Trouble with Meat. Her poetry has been published in The Adirondack Review, Pebble Lake Review, Lodestar Quarterly, Poetry Midwest, Rattle, and many others. She has been nominated twice for a Pushcart Prize, and she teaches English at CUNY. The Transparent Dinner, her book of poems, was published by Mayapple Press in 2006, and her next book, Saints & Cannibals, is due out in Fall of '09. For more about Christine, go to chamm.blogspot.com.